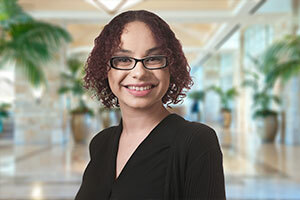 Deja Bock is a Paralegal at Grasso Law Firm. Ms. Bock graduated from Rio Salado College in 2016 with high distinction and in the top 15% of her class, with an Associate’s Degree in Applied Science in Paralegal as well as a Certificate in Paralegal Studies. She was also a Member/Alumni of the National Society of Leadership and Success, promoting accomplishment and achievement in personal goals. She has been working as a Paralegal for about one year and has experience in insurance defense and family law. In her spare time, Ms. Bock participates and enjoys all aspects of art and dance, especially in the Hip-Hop sector. She also spends a lot of her time with her close family of three siblings playing sports, practicing routines and studying. Ms. Bock is passionate about learning and expanding her knowledge in the legal field, when she’s not dancing or with her family, you can find her with her nose in a book.